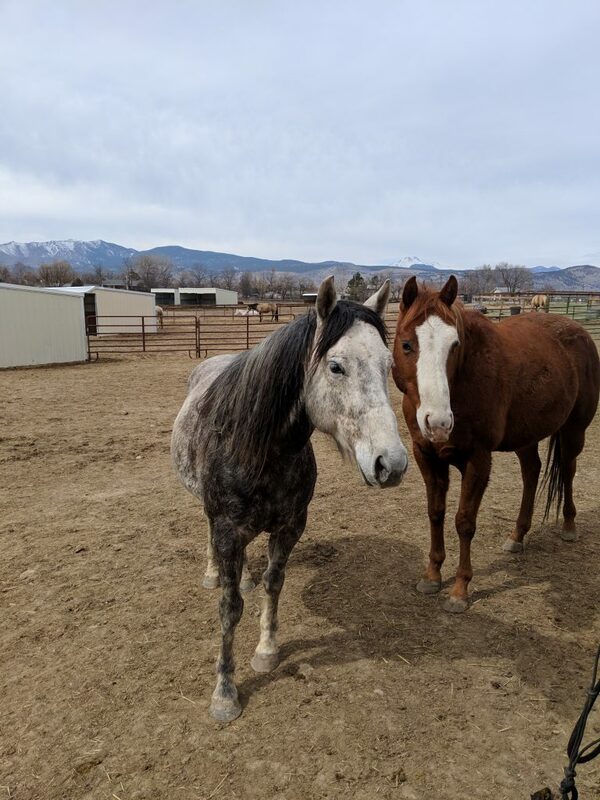 If you haven’t been following along, catch up on Odin’s story on the Colorado Horse Rescue website (here) and on our latest blog post from March 5 (here). Today we just have a quick check-in with Odin! Recall that when Sarah and CHR saved Odin from auction, he was a terrified unhandled stallion. On intake at CHR, he was a bit underweight at 870 pounds. While in quarantine he lost some weight from persistent running and pacing. These days, most times we go out to visit, he is sprawled out, sunning himself. Today, he was hanging out with a friend. Before giving him a thorough grooming, we popped Odin up on the scale in the barn. The little guy is working on developing the perfect gelding bod. Now he’s almost ready for more work and to build some muscle! To find out Odin’s weight, you’ll have to watch the video below! Looking for a small and compact but powerful little partner who loves to jump and is smart as a whip? Consider sweet Odin at Colorado Horse Rescue!